Chocolate And Biscuit Pie recipe by AmbUs at PakiRecipes.com. This pie has a base not of pastry but of crushed chocolate biscuits (Graham crackers), mixed with melted butter. 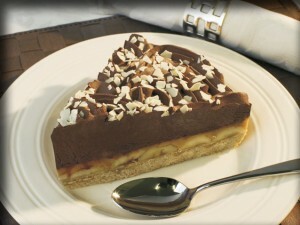 The filling contains cream, chocolate and is smooth and silky in texture. Add 60 g butter to the crushed biscuits and blend well. Press the mixture into the base and partway up the sides of a 20cm (8in) loose-bottomed cake tin, then chill well. Combine icing sugar and remaining butter (115 g ). Add melted chocolate and beat until the mixture is thick. Add thick cream to the chocolate mixture and mix well. Spread the filling over the biscuit base and chill for about 1 hour. Decorate with cream and chocolate curls.